The siege on Paul VI’s 1968 encyclical “Humanae Vitae” has racked up two new assaults in recent days. But also an energetic counterattack. The first and more authoritative assault bears the signature of Cardinal Walter Kasper. In a booklet released contemporaneously in German and in Italy he exalts the “paradigm shift” inaugurated by Pope Francis with the exhortation “Amoris Laetitia.” A paradigm shift – Kasper writes – that does not limit itself to allowing communion for the divorced and remarried, but “concerns moral theology in general and thus has effects on many analogous situations,” including none other than recourse to artificial methods of birth control. Kasper does not find in “Amoris Laetitia” the passage – in effect nonexistent – that would explicitly legitimize the use of contraceptives. But he points out that Francis, when he cites the encyclical of Paul VI, “encourages the use of the method of observing the cycles of natural fertility, but does not say anything about other methods of family planning and avoids all casuistic definitions.” From which Kasper deduces that “in ‘Amoris Laetitia’ even that which is not said may say something,” meaning that it may give the go-ahead to contraceptives, entrusting the use of them to the “deliberate decision of conscience” of the individual. Pawel Stanislaw Galuszka, “Karol Wojtyla e ‘Humanae vitae’. Il contributo dell’Arcivescovo di Cracovia e del gruppo di teologi polacchi all’enciclica di Paolo VI,” Cantagalli, Siena, 2018, pp. 550, 28 euro. Among the documents published for the first time in this book, Moia isolates a letter written by Karol Wojtyla to Paul VI in 1969, after numerous episcopal conferences had spoken out critically against “Humanae Vitae.” In that letter the archbishop of Krakow asked the pope to publish urgently an instruction against the “harmful opinions” that were circulating, reiterating even more forcefully the teaching of the encyclical. 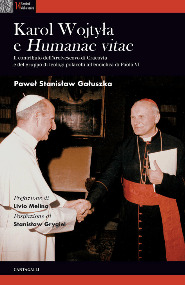 In reality, the erudite book by Galuszka documents not only Wojtyla’s important contribution to the drafting of “Humanae Vitae,” but also the extraordinary expansion that he offered afterward, as pope, to the comprehension of that encyclical, both with the cycle of catechesis on the theology of the body from 1979 to 1984, and with the encyclical “Veritatis Splendor” of 1993. And here we are at the counterattack in defense of “Humanae Vitae,” which has been expressed both with the publication of the book mentioned above and with the presentation of it that was made on Wednesday, March 7 at the Pontifical Lateran University by Cardinal Gerhard L. Müller, the Polish philosopher Stanislaw Grygiel, and the Italian theologian Livio Melina, in addition to the author of the book, Pawel Stanislaw Galuszka of Poland. Melina, formerly the dean of the pontifical John Paul II institute for studies on marriage and family, is also the author of the preface to the book. His contribution on March 7 is reproduced in its entirety on another page of Settimo Cielo. And these are his parting shots, in which he immediately takes aim at both Kasper and Moia, after which he makes an interesting reference to the letter “Placuit Deo” published a few days ago by the congregation for the doctrine of the faith, with the approval of Pope Francis. Today one hears ambiguous talk of an epochal “paradigm shift,” which it is alleged must be applied to Catholic sexual morality. In order to impose it there is also underway a questionable attempt at historical reinterpretation, which contrasts the figures of Paul VI and John Paul II, seeing in the second an intransigent and rigid traditionalist who is thought to have compromised the open and flexible attitude of the former. In reality, this crude and arbitrary falsification is made only to serve an ideological manipulation of the magisterium of Pope Paul VI. Putting between parentheses the teaching of Saint John Paul II on the theology of the body and on the foundations of morality, his catecheses and “Veritatis Splendor,” in the name of the new pastoral paradigm of “case by case” discernment, does not bring us a step forward, but only a step backward toward casuistry, with the disadvantage that at least that was sustained by a solid ecclesial and cultural context of Christian life, while today it could not help but result in the total subjectivization of morality. Pope Francis recently approved the publication, by the congregation for the doctrine of the faith, of the letter “Placuit Deo,” which among other things warns against a resurgent neo-Gnosticism. Is not this perhaps the poison that is hidden in these self-proclaimed reinterpretations and implementations of “Humanae Vitae,” which beyond the outmoded letter would like to grasp the spirit, or which, presumptuously denying its normative pertinence (“The problem of ‘Humanae Vitae’ is not pill yes or pill no”), extol it for a vague and empty anthropological propheticalness, an affirmation of values that are then left to subjective interpretation, according to the circumstances? Against these tendencies, the book by Pawel Galuszka is a potent medicine, which allows us to breathe the good moral theology of Karol Wojtyła, a devoted and faithful son of Paul VI first and then his great successor on the see of Peter.